One of the fascinating notions about any style magazine—particularly a fashion icon like Vogue—is that there is the glamorous, glossy-paged issue itself, and then there is the magazine’s impact upon the reader. Throughout its century-plus history, Vogue has provoked, awed, and broadened the horizons of both women and men; it has lain upon sleek coffee tables or brightened otherwise dreary subway rides; it is aloof yet accessible, international and domestic, and it remains an undeniable monthly fashion bible. In 2000, American Vogue began its “Nostalgia” column, focusing on certain actors, writers, filmmakers, designers, or other intriguing individuals and their remembrances of a Vogue image from past issues. A decade’s worth of these photo-inspired essays have been brought together as Nostalgia in Vogue, forming a collection wherein every vignette is captivating, with an irresistible combination of brevity and intimacy. The reflections offer not only a survey of fashion through the years but also a distinct feel for the spirit and social values of the times. To spotlight the best selections from Nostalgia in Vogue is near-impossible, as so many essays are exceptional and flow even better in a consecutive rhythm. The juxtaposition of those recalling a favorite photo along with those who were actually photographed is also particularly appealing. Consider the story of Beverly Johnson, the first African-American to grace the cover of Vogue, in 1974, who, upon learning at the last minute that she had made history, hurried to the corner newsstand to buy a copy. In her excitement, however, she forgot her wallet, and despite showing the hardhearted New York cashier that she was indeed the cover girl, he refused to give her the issue for free. Other slices of Vogue and life spotlight artist Frida Kahlo, rocker/writer Patti Smith and a girlhood hat, Anjelica Huston contemplating her younger self, “Daddy of Cool” James Coburn, Joyce Carol Oates, Joan Silber and her waitress job at bygone hotspot Max’s Kansas City, and how Jerry Hall’s vivid lips inspired Lipstick Queen Poppy King to create her own line of luscious reds. 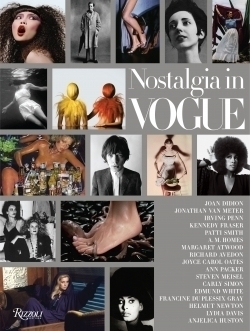 Nostalgia in Vogue is a delight of style, substance, and words finely honed to match the featured photographs, as well as being a splendid reminder of how Vogue, the magazine, continues to represent the beauty, brains, and character that makes them memorable.